I start the year with an ocean them and so I used two kinds of construction paper as my ocean background. I had them laminated and alternated them to make a contrast. I feel this makes it easier for my students to identify the sections of the words. The letters are just Trend letter that have been laminated. The ocean cut outs come from DJ Inkers Ocean Bulletin Board set. As I've mentioned in previous posts, most of my room is color coded, red for Kindergarten, blue for 1st grade. At first I thought the 1st grade words would get lost in all the blue green of the background but this color blue has enough contrast they seem to pop. The red stands out a lot, but that is also good for my Kinder Kids who are experiencing the word wall for the first time. I am sure you have noticed that all of our words are laminated. Long ago, I used to write the words on sentence strips and put those on my word walls. Well, that was when I had a much larger room and had much more space for my word wall. 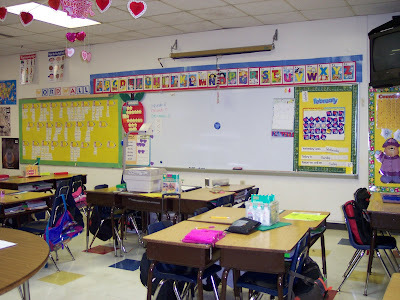 Here is a picture of the classroom I had 5 years ago in FL and taught first grade. If you look close the word wall is on the far left on yellow butcher paper. All I have to do as I take down my word wall, is to put the words in the right envelope. One of the tasks I am assigning myself this summer is to write all the words on the front of the envelopes so that I do not have to refer to my long term plans to know which words go in which envelope. There are several types of words walls I like but can't do. First, it the interactive word walls. 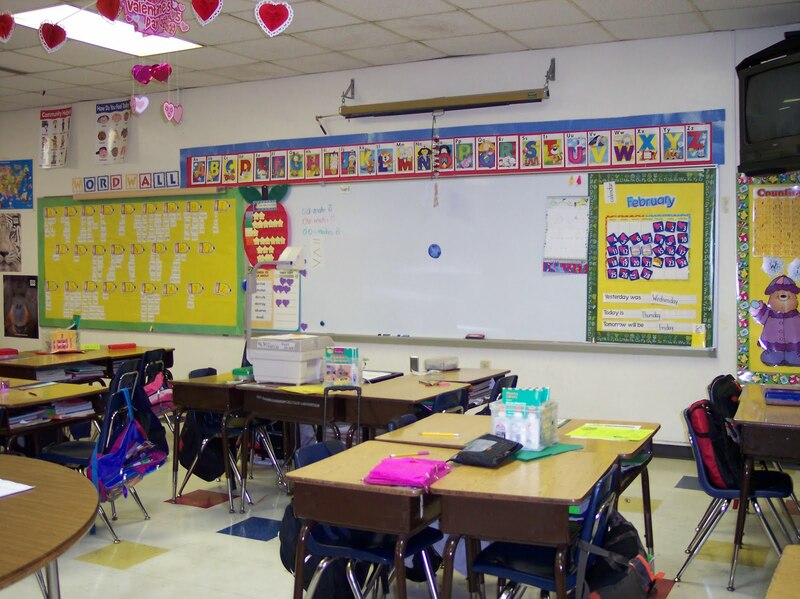 These word walls are low enough for students to go get words from the wall and take them back to their seats, write the word and then take it back to the wall. I can't do this because my board is too high for my students. However I have done a Fancy Word interactive board. I adore this little project because I love seeing the students getting out of their seats and actively learning new words, as they use the board. I hope this helped you, in one way or another. I always say, even if you have a bad example, you have learned what you DON'T want to do. Here I go, my first linky part. Here is your bit. What kind word wall do you have in your room? Love your word wall! I need to sort my words at the end of the year too and decided to put a number on the back of each word to tell me which list it is in (we use Dolch words). You could do the same thing with your words - just number them with the number of the week. It might save you the time of writing the words on the envelopes. I have a couple of my kiddos sort the words into baggies at the end of the year and then they are ready to go the next year. Just thought I would share what works for me. That is BRILLIANT! Thanks for sharing. I will be doing that. Or you could label like we label our math series lessons... For theme 1 week 1 you would label 1.1 and for theme 1 week 2 you would label 1.2, etc. Just an idea to keep with your already labeled envelopes. Good idea. Keep them coming. Thank you, I am glad you were able to get something from my post. This is an excellent blob post/link party!! 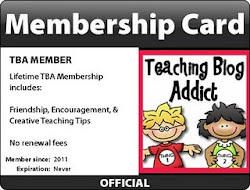 I'm new to the teacher blogging world, I'm actually just a first year teacher. My word wall was a complete mess this year. I relate a lot to what you said about your first word wall in Florida. I will be re-doing my word wall, and am thinking about what to do with the current words on my wall, since I know I'm not going to use them next year. 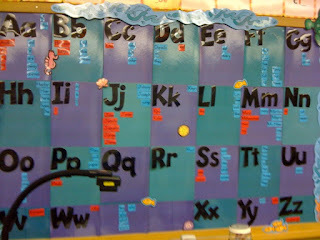 Fantastic layout for your word wall which has given me some ideas for something I can do in my room! Great blog, I am glad I found you! 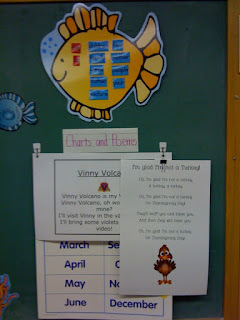 I really like your Fancy Word wall idea--I would join your linky party and post my word wall but I have already taken it down this year as I am moving classrooms. And really it's something I try to make better every year. I have been thinking of redoing my organization of my words, while they are stored. In my new room I want to try and have something like the fancy words too. Thanks for sharing your ideas. I have 3 word walls. 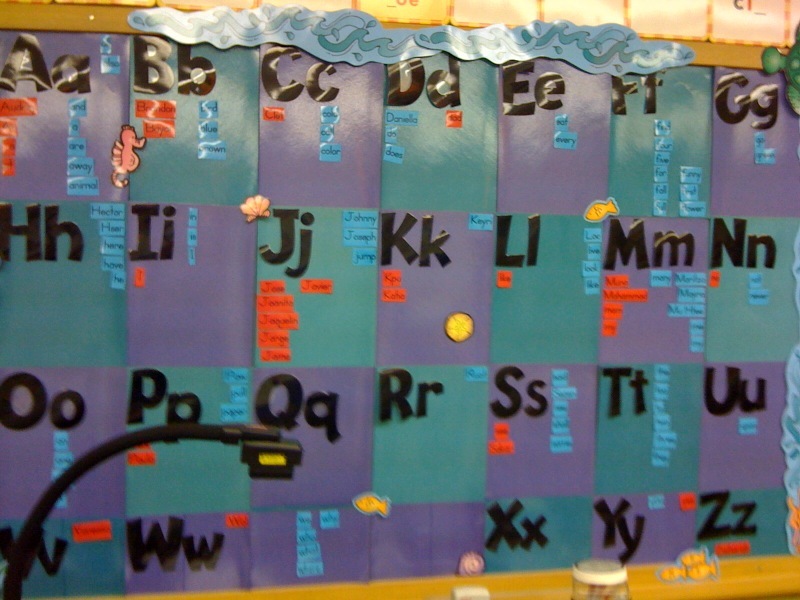 Wall 1: SIGHT WORDS-white index cards with blue consonants and red vowels for most kids. (each child has their own baggie of words and we add 5 words on *most Mondays on full size index cards)***I have a differentiated group with colored index cards for "kindergarten" level words. Wall 3: DICTIONARY WORDS-I have a box of illustrated words and on the back there are 5 illustrated words that define the word on the front. I both 2 sets of these words and have them "poked" between the ceiling tile frames (one corner is held by a push pin). This has really been utilized during journal time). WOW, I love that you have 3 word walls. I with I had that much space. Thanks for sharing. 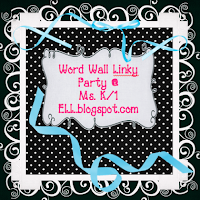 Thanks for hosting this word wall Linky Party, great idea! I use Rainbow Words so my words are color coded. At the end of the year I put them in sandwich size ziploc bags by color and then into hanging file folders for quick access next year. I am so happy to participate in your little party! I know we all learn when we all participate and share. Thank you for the opportunity, and by the way...that fancy word wall is an excellent idea! 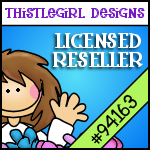 I just started a "Lots Of Linkies" Linky party to help keep track of Linky parties all over Blogland. You are welcome to link yours up to it. Thanks for sharing! I am working on my word wall. What did you put the words on? Construction paper? Do you have a template that you used? 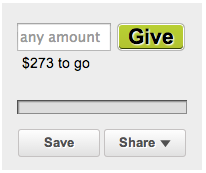 If so, can you email to me donnalovesherbert@gmail.com??? Dratchford, the words were just printed on regular colored paper. I don't have a template and I am actually having a hard time because I have to print a second set and I am going to have to type it all up again. :( If I get it all done, I will put up what I make. 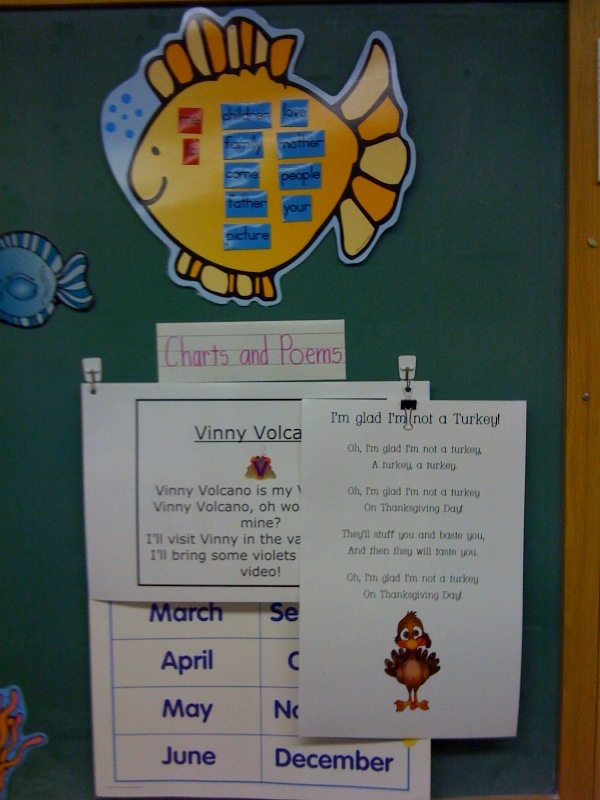 Just today I was looking for some ideas about wall words, not popular in Italian classrooms, and I found your blog...I will take some idea, but I need to come back in order to read everything slowly...thanks for sharing! Free blog buttons for you. 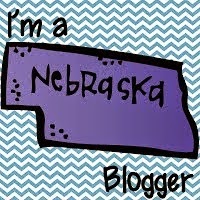 A new blog for you... and a free blog button.